From Brene Brown’s book “The Gifts of Imperfection: Let Go of Who You Think You’re Supposed to Be and Embrace Who You Are”, which I’m really enjoying reading. 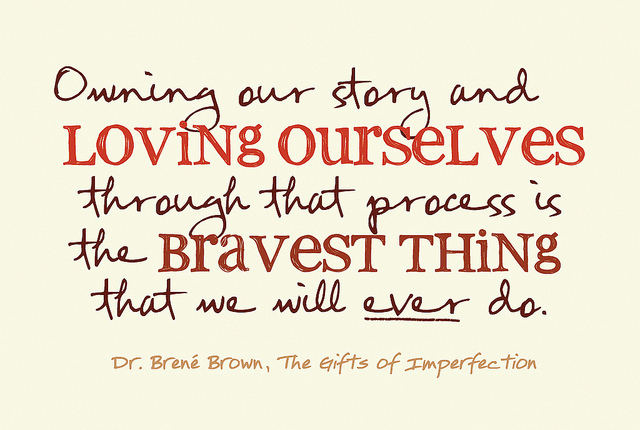 Loving yourself, with all your imperfections, and the process to do so may be incredibly uncomfortable and scary. And while it requires a lot of hard work, it’s one of the most important, and bravest, things you can do. Not only for yourself but also for everyone you meet throughout your life’s journey. The process of embracing who you are is one I have been working on for a long time. And, likely will be on for the rest of my life. Only recently I have started to see some of the progress I have made and the sense of calm that comes with accepting, embracing and loving yourself. This entry was posted in Self-growth and tagged acceptance, loving yourself, responsiblity, self-esteem, self-growth, tools on March 14, 2012 by Lyndsey.